Operating Era: 1909-1955. S-40-3 Pressed Steel Underframe Stock Car, Modern Version, No Fascia, Double Deck, SP. 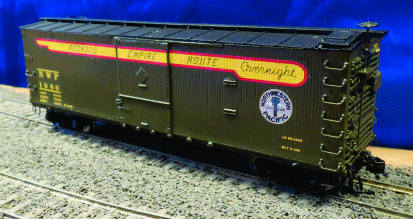 For later lettering of SPDeM Cars use Decal Set D5203. Please request at time of ordering. Truck Recommended: Early production: Tahoe Model Works TMW-203. Later production: KD #509. 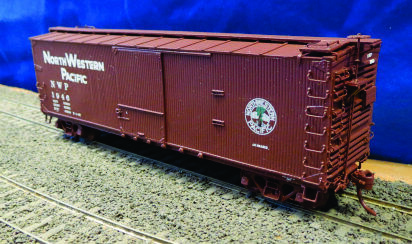 Our newest HO Kit release is the S-40-3 Pressed Steel Underframe Stock Car for the Southern Pacific and Union Pacific Railroads. The SP Kit also cover subsidiaries Galveston, Houston & San Antonio, Houston & Texas Central, Southern Pacific de Mexico, Oregon & California and Texas & New Orleans. The UP Kit also covers subsidiaries Oregon Railway & Navigation, Oregon Short Line and Oregon-Washington Railway & Navigation. These 36 foot, 6 inch fishbelly side frame cars, sometimes referred to as Harriman Standard design cars, were built starting in 1909 with the last ones built in 1911. The pressed steel underframe was first developed by the Pressed Steel Car Co with the Harriman mechanical design department developing theirs concurrently. The S-40-3 stock car is similar to the S-40-2 except for the trucks. The Stock cars had four distinct periods of existence, all modeled by our Kit versions. The original version, 1909-1913, was without end or left of side grab irons or steps and had a large fascia on the sides and ends. The UP used the upper fascia for the reporting marks, car number and spelled out railroad name. The SP initially used the upper fascia similarly to the UP, but changed to a side placard for their reporting marks around 1912. The safety appliance version ,1913-1925, had all steps and grabs added per the Safety Appliance Act. This version retained the large fascia on the sides, although the UP added side lettering placards for the reporting marks. Beginning in 1920, SP made their reporting marks placard larger. The rebuilt version, 1925-1940, had the end fascia removed. The SP cut down the side fascia to match the top of the side doors and later notched it to clear the grab irons. The UP cut down the side fascia and shortly removed it entirely and added a side placard for the “Union Pacific” spelled out. The roof grab configuration was also changed. The modern version, 1940-1955, had all side fascia removed and one or both end doors removed. The SP cars lasted into 1955. The UP changed their lettering to gothic style but their cars only lasted until 1952. The S-40-3 cars were all equipped with Andrews L Section trucks.